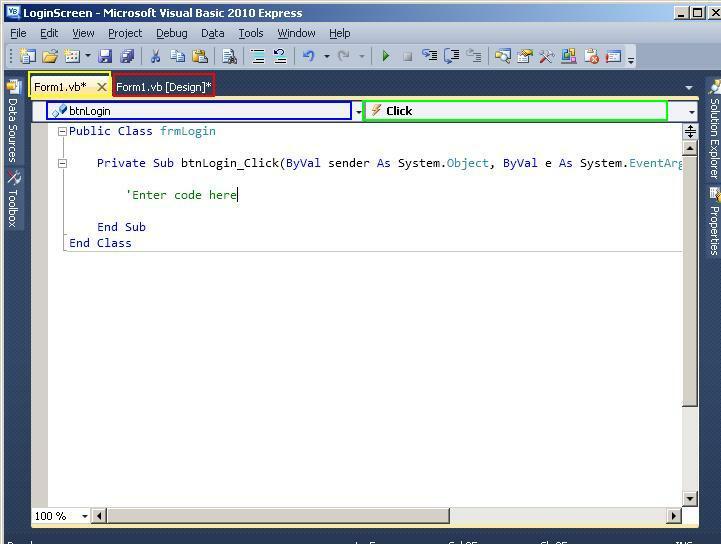 Visual Basic also known as VB is a programming language from Microsoft. It is part of the Microsoft Visual studio software package. Using Visual Basic you can develop Windows and Web applications. Visual Basic is an Object Oriented Programming with full capabilities and concepts like objects, properties, classes, events, methods, inheritance and encapsulation. In addition to Visual Basic, Microsoft Visual Studio includes Visual c# (C sharp), Visual C +, Visual F+ and a few other titles. If you look for our old content on Visual Basic, please visit VB 6.0 page. How do I learn Visual Basic? 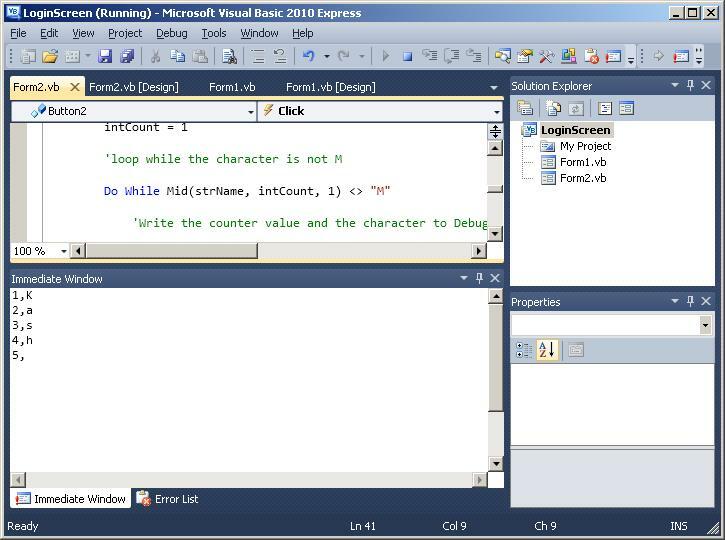 In our opinion, the best way to learn Visual Basic is with Hands-on examples. 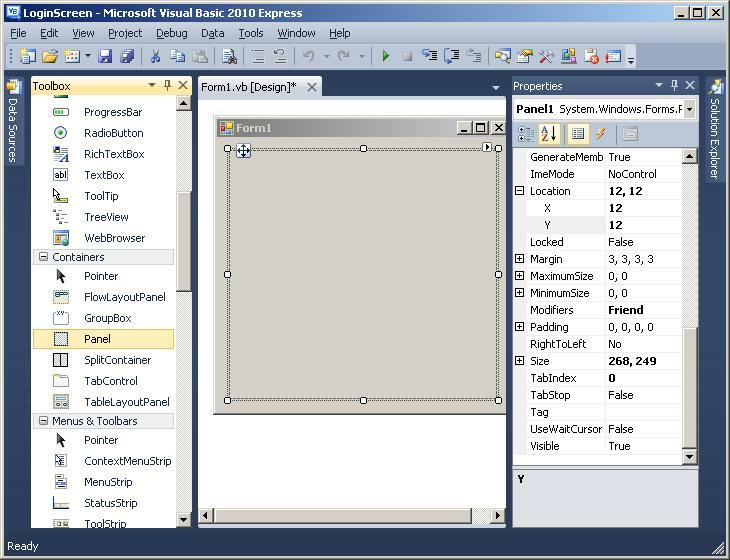 In today’s tutorial on Visual Basic, we will use Microsoft Visual Basic 2010 Express . .
All Programs > Microsoft Visual Studio 2010 Express > Microsoft Visual Basic 2010 Express. You will get a new window similar to the one shown below. Here you can choose what type of Visual Basic project you will create. 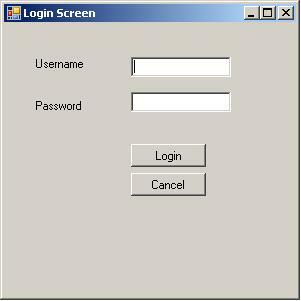 We select Windows Form Application, type LoginScreen for the Name and click OK. If you do the same thing as above and click OK, you should see the VB GUI (Graphic User Interface). It is also known as Visual Basic IDE (Integrated Development Environment). This is where you have all the necessary tools and commands that will help you build the application. 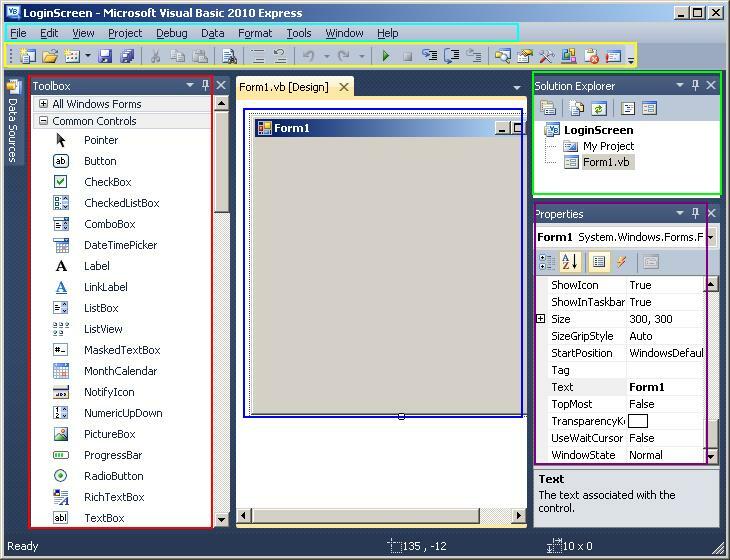 Before we get going with our example on Visual Basic 2010, we are going to cover basic VB GUI windows. Toolbar: Right below the File Menu, you will see icon for commonly used functions like Copy, Paste, Save, Inserting comments, Debugging (green play button) and other debugging options. Toolbox: This is on the left side of the IDE and enclosed in red color. This is the container of all different object controls and objects like text boxes, labels, command buttons and others available in VB. Properties: Highlighted in purple, this is where you can review properties of form controls. You can also change objects properties anything from size to dimensions to color. 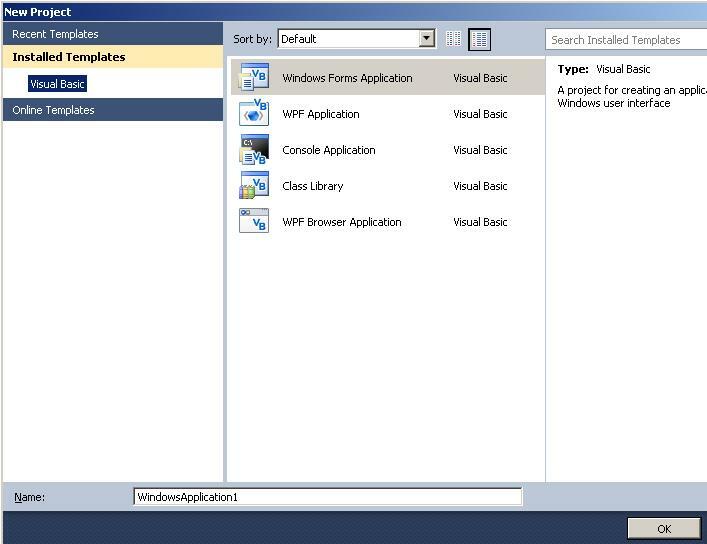 How to create a Visual Basic application? The best way to learn anything is by getting your hands dirty and practicing with it. We are going to do just here with a new Visual Basic application. We will be developing a simple project that can be used as a login screen. We will need a form with textboxes for username and password entry. The program should then check the credentials and give out a message for either approved access or denial. First we are going to add some VB controls. We begin by adding a Panel object to our form Form1. In order to do this, you can drag the Panel (light orange) from Visual Basic Toolbox window and drag it onto the Form in the middle. Notice Location and Size values in the Properties window on the right side. We have highlighted the VB Controls in the Toolbox window below (purple) and actual txtPassword control on form Form1 (blue). When we did that, it shows the property of this text box in properties window (red). How will the Login VB application function? First the user will enter their username and password information. When they click on the Login button control, the VB program then needs to check the username and password credentials. If a match is found, a welcome message is displayed otherwise we will politely tell them to leave the premises! Ready to enter some VB Code? Before we explain this programming code, let’s cover the basic of conditional logic in VB. Again in plain English, if the first condition is not true, then the code after the Else is executed. Ready to Execute the VB Program? floppy drives icon on the Toolbar. We enter LoginScreen in the Name, Location of c:\Temp and click Save. Now we can run the Visual Basic project. You can execute a project by either clicking on the Green play button on the Toolbar window or selecting this from the File Menu. When we did that on our end, here is what we see on our Putr. You can see data entry form where you can enter username and password information. Woohoo! Our program is now working just as designed. 2. 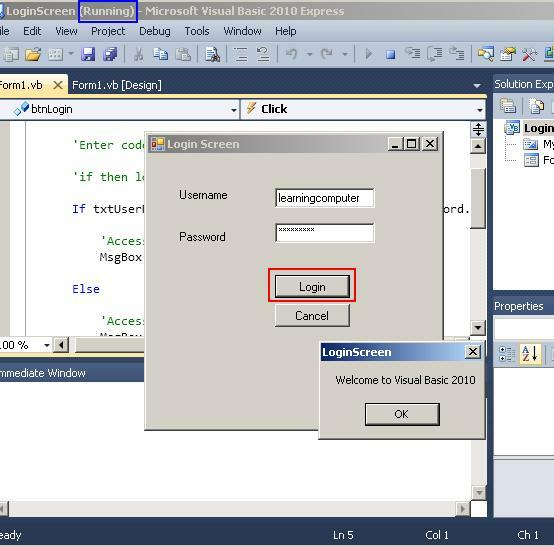 When you clicked on Login button control, VB 2010 displayed the Welcome to Visual Basic 2010 message box. In other words you have passed the Login screen. Subsequently we want to test the else condition. All we need to do is to try another username/password combination. When we did that, we got the Access denied message shown right below. After that Visual Basic closes the form. What about the Cancel button? One minor thing we forgot to mention. When the use clicks on the Cancel button control, we would like to close the application. Here is the code for that, similar to the Else block. 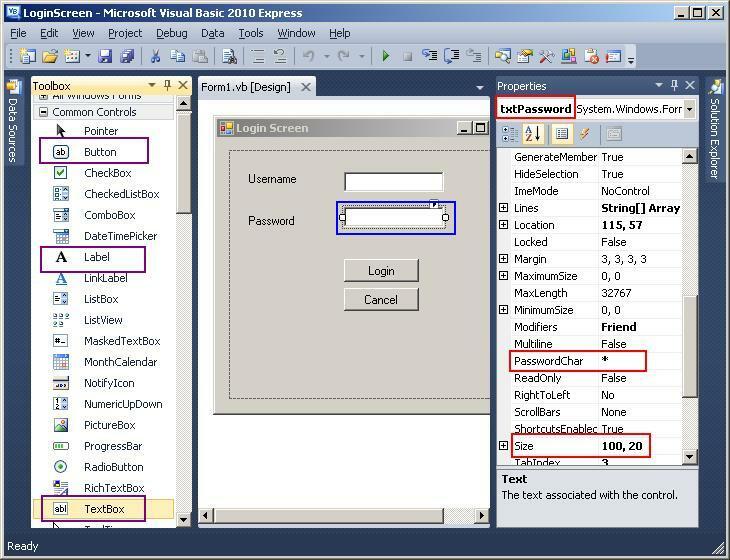 This finishes the simple Login Program for VB 2010. In Visual Basic, you declare variables to temporarily store values during the execution of a program. Variables have a name and a data type (which determines what kind of data the variable can store). You declare a variable with the Dim statement, supplying a name for the variable. Type: One of the many VB data types e.g. integer, string, data, variant (default) etc. First we declare two variables, one to hold the name and the other to hold customer ID. Next we assign value to these variables. Finally we display the values using a Message box. One new item here is this & symbol which is used to concatenation (combining text together) in VB 2010. You can add this code to a new btn control’s click event like we have already showed you earlier. After that you can execute the program and then click on the btn control. We have highlighted the variables in red rectangle for your understanding. Lets look a little further into these. 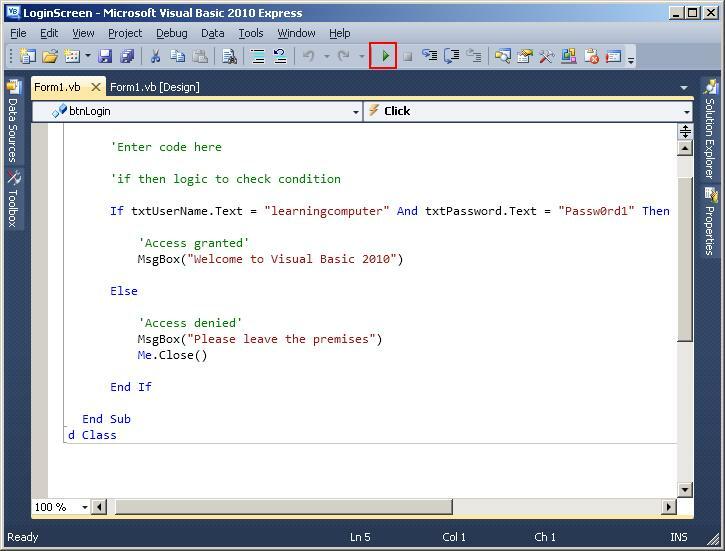 In order understand the Visual Basic For-Next loop, lets us use a simple example. We will loop five times and simply display the counter value in the Debug window. The Debug window is typically used to trouble shoot issues in Visual Basic programming code. We start with declaration of intCount as an integer. Next we open the For – Next loop with starting value of intCount=1. We will use Debug.WriteLine to display the counter value in the Debug window. vbCrLf is constant value for carriage return character and line feed character. Basically it force the program to go to a new line. Then we loop through the procedure five times. Unlike the For – Next loop, the Do – Loop statements repeat a block of statements while a condition is true. You can important Do – Loop by either using Do .. While or Do .. Until loop. Lets look at one of them next. With Do – While statement, you can have a Pre-test loop where the loop condition it checked first. Here is syntax for a Pre-test Do .. While statement. Exit Do: Optional; statement to break out of the loop. We are going to create a VB program where we are looking for a particular character in an expression. Our expression is “Kash Money” ofcourse. We would like to read one character at a time using the >VB MID function. When we find a “M” we would like to stop execution. Lets us review the code. We declare two variables, intCount to track counter value and strName to store the expression. Next we assign values to these. We start out the loop with this VB code, Do While. We are also using MID function. You can read more about this on this function page. Basically it will read one character at a time in our expression, “Kash Money”. As we are reading the values, we also print the output to the Debug window. We are displaying, the counter value and the character found by the MID function. Finally we increment the counter by 1. This will continue execution till it finds the character “M” and then will stop. If you would like more information about Visual Basic this is a useful link to look into.